The Tata Open India International Challenge title win triggered a rise of five spots for India’s rising star Lakshya Sen. 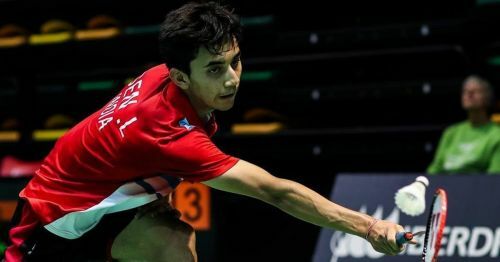 In the new world rankings announced by the Badminton World Federation (BWF) this week, the 17-year-old has moved up five spots to 110th. The Asian junior champion previously attained a career-best ranking of 69 this June. The former junior World No. 1 has had a stellar season on the junior circuit this year. Besides the aforementioned Asian Junior Championships gold medal, he also went on to clinch a silver medal at the Youth Olympics and a bronze medal at the World Junior Championships. He finished the season by triumphing at the Tata Open, a year after losing the final to Sitthikom Thammasin in three close games. Among the other top Indian men, HS Prannoy and Sai Praneeth too witnessed changes to their ranking this week. While Prannoy rose to 21st, Sai is now placed at 23rd. Kidambi Srikanth, who ended his season even before the Syed Modi International tournament, is static at the 8th position. The Syed Modi International champion Sameer Verma, who has qualified for the BWF World Tour Finals, stays at his career-high position of 14th. Beyond the top 25, Parupalli Kashyap is 44th, Subhankar Dey is 49th, Ajay Jayaram is 51st, and Sourabh Verma is 53rd. Among the top women stars, PV Sindhu continues to sit in sixth while Saina Nehwal is still ninth. Former national champion Rituparna Das is the next highest-ranked Indian shuttler in women’s singles at 51st. In men’s doubles, Satwiksairaj Rankireddy and Chirag Shetty are 18th, Manu Attri and B Sumeeth Reddy are at 26th. The top Indian women’s doubles pair of Ashwini Ponnappa and N Sikki Reddy are at 22nd. In mixed doubles, Ponnappa and Rankireddy maintain their position as India's No. 1 pair at 21st. Pranaav Jerry Chopra and Sikki Reddy closely follow them at 22nd.